Steelwater Gun Safes Company offers gun safes for low prices. We will work through the safe brand’s various offerings in the Steelwater Gun Safe reviews below. Unlike many other companies that change the features of their safes Steelwater has not had a mechanical change for years. You can buy replacement parts for your safe from the business after you have had your safe for several years since they rarely make mechanical changes. Other gun safe companies stop making parts for safes after they manufacture a new model. Have you been looking for the gun safe that suits you but you have not found one? Check below 2 products and have a look at our best-rated gun safes as well as top gun safes list under 1000$. Well, Steelwater has many safes to choose from with many different features you might enjoy in a gun safe. The owner’s experience has helped him make Steelwater one of the most stable guns safe manufacturers in the industry. The owner has five years of experience in law enforcement. He also has twenty-two years of experience in servicing, repairing, and opening safes. Steelwater safes are fireproof. The safes also come with pre-drilled holes so you can secure them to the floor for extra protection. 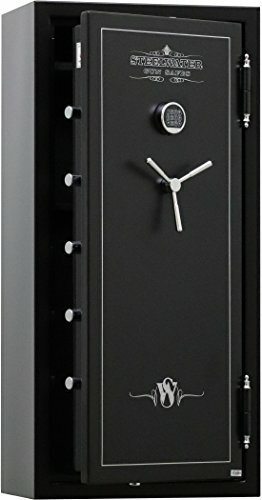 This safe is a larger model. It will house twenty-four to thirty guns. It will withstand fire for an hour at temperatures up to 1,875 degrees Fahrenheit. The interior is lined with grey carpet to keep your weapons and valuables from being scratched by the steel. It is equipped with shelves to store your smaller valuables, handguns, or ammunition. In the event, your gun collection grows you can remove the shelves. This safe’s storage functionality ensures that you conform to the relevant gun safety rules as set out by the California State Department of Justice. You get a free door organizer and a dehumidifier if you buy the safe directly from the factory and it also comes with a limited lifetime fire and burglary warranty. The door seal is heat activated and it will expand in the event of a fire. It keeps out water and smoke. It is equipped with a drill resistant plate behind the lock making it impossible for a thief to gain access to the safe by drilling out the lock. Has pre-drilled holes on the back of the safe for you to install the dehumidifier quickly and easily. Equipped with a spring-loaded relocking bolt in the event a burglar removes the lock. There are four pre-drilled holes for you to anchor the safe to the floor. The storage space is limited when the shelves are installed. The combination has to be set by Steelwater or a qualified technician. The warranty will be voided if you change the combination. In order to fit more than eight guns, you will have to remove some of the shelves. This is a smaller safe with some excellent features. It can withstand temperatures up to 1,550 degrees Fahrenheit for forty-five minutes. The interior of the safe is lined with grey carpet to keep the steel from damaging your guns or other valuables. It has two sections. Each section can house at least eight long guns each. It is equipped with four removable shelves to store your handguns, ammunition, or small valuables. This safe is equipped with an electronic lock, so it is quick to access the contents. Unlike a combination lock, you can program your own passcode without a qualified professional or Steelwater. The external battery compartment is making it easier to change the battery and gain access. Re-locking bolt in the event the lock is removed from the safe by a burglar. Pre-drilled holes to anchor the safe to the floor and pre-drilled holes to install a dehumidifier that fits in it. See our list of the gun safe dehumidifiers‘ reviews to find the best one to go with your Steelwater 20 Gun Safe. The gun safe will not hold twenty guns if you do not remove the shelves. Like on many safes with electronic locks the passcode is a little complicated to program. 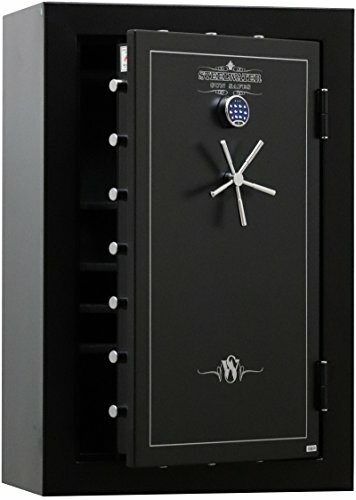 If you are a gun owner and you have a tight budget then Steelwater Safes would be something I recommend looking into. Steelwater Safes offer a high-quality product cheaper than many of the other companies in the industry. You are sure to find all the features you are looking for in a Steelwater safe. All of their safes come with pre-drilled holes to anchor the safe to the floor and pre-drilled holes to mount a dehumidifier. Many of the other companies come with the anchor holes but not holes to install the dehumidifier. If you drill holes in a safe, then it will void the warranty. The only downside about Steelwater Safes is buying a safe with a combination lock. If you purchase a safe with a combination lock, you cannot enter your own combination. If you change the combination, it will void your warranty. Don’t forget to check our best gun safe reviews list before you decide! Don’t forget to check our best fireproof and best biometric gun safes list before you decide! can i fit my 20′ 870 combo shotgun inside the 16 gun safe heavy duty?